Scott and I just got back from an AMAZING long weekend in Arizona. We were out there for the wedding of a family friend and though much of our time was spent on fun Wedding Weekend Activities, we used all the rest of our available time for adventure. Scott rented an FJ Cruiser for our stay and is now in love with this car. I found it to look like a car from a Disney Attraction but he loved it's "off-roading" capabilities. We drove over 800 miles in 3 days and saw so many beautiful things. It was the first time we had this much time alone since our kids were born. 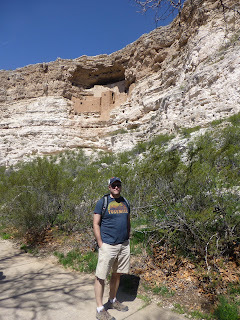 It was great to hike, chat, eat slow meals and explore a part of Arizona we have both never seen. The wedding was an hour north of Phoenix and that is where we stayed. We hiked some amazing trails around the resort, took in the sunrise on the first day, we also visited Wickenburg, drove part of the Apache Trail and spent a day in Sedona. Every place we visited was spectacular and left us in awe. We hiked every day (sometimes more than once a day), saw some great wildlife and worked up a big appetite. The wedding weekend was busy with an Out of Town Guest Dinner, the Wedding and a Send off Brunch. All was lovely and we enjoyed our time with our family friends. We delayed our flight home by 11 hours because of the foot of snow that was falling at home. This afforded us one more night in a hotel and allowed us to skip the Red-Eye flight. It was a bit crazy to go from 90 degrees and sunny to 29 degrees and snowy but we sucked it up and traded in our sandals for winter boots. The whole weekend was great and much needed. A big THANKS goes out to my parents for taking such good care of Z and C (they had a BLAST) and our friends who also helped with care and transportation on Friday. It takes a village and we are so grateful for ours!!! Yay! Shout out in the middle of the blog! I'm glad you got it! I hope you enjoy it as much as I did. I Love AZ it is so beautiful and thinking about the 5-8 inches we are excepted to get on Sunday I would go in a heartbeat.